Home/ Articles/ blog/ Happy 4th Birthday Pinegrow! Pinegrow 1.0 was born on January 8th, four years ago. At that time, Pinegrow was just one more indie app, launched with zero marketing, facing the most likely prospect of never making it through the first year. Yet somehow, the stars aligned and sales started trickling on the very same night. Pinegrow made it to 2, 3 and now 4, improving and adding many web development features on the way. First, thank you for all your support, for investing your time and money in us, for all your feedback and patience, or for simply following the journey of Pinegrow. And just for today, we’re running a quick sale with 1/4 (25%) off all Pinegrow license renewals and upgrades. A tip: you can renew your license for one or more extra year of updates, even if it still valid for updates. 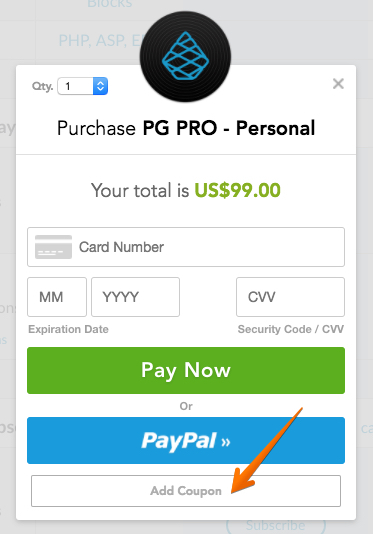 Renew or Upgrade your license and use the coupon code JAN82017PG during the checkout (click on the “Add Coupon” button on the Card / PayPal selection screen, as shown here) to get the discount.